Join us for our upcoming Lunch & Learn “Being with the Dying” March 26th, 2019 at 12pm at the Avon Public Library. Please feel free to bring a sack lunch to enjoy during our talk! Our new Tuck-in program is designed to maximize the role of the volunteer in assisting other team members to operate more effectively and efficiently. In this program, volunteers make weekly phone calls to patients/caregivers to assure that they have necessary supplies, medications, and/or support for the weekends. That information is then relayed to the appropriate case manager to enable them to act on meeting the specific needs of patients and caregivers. Space will be provided for you at either our Glenwood Springs main office location, or in our Edwards Branch at the Shaw Cancer Center. Fill out the Volunteer Application if you’d like to be a part of this new program, or call for more information! One of the things that sets Hospice of the Valley apart is that we have close to 100 local volunteers across our service area who graciously give their time to our organization. 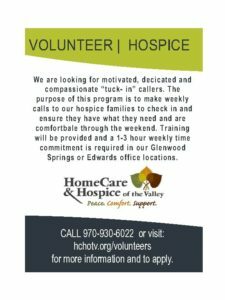 If you would like to serve Hospice of the Valley as a volunteer please complete the Volunteer Application, above. There are many ways to contribute – direct patient care, bereavement support, advance care planning, special event support, handyman tasks, sewing Memory Bears and ornaments, and office support. After a patient visit, please fill out the activity report, above. These may be as succinct or as detailed as you wish. Reports are secure once sent, and go directly to the Volunteer Coordinator. Please complete the form, above, to update your information in our records so that we may match you with the best fit in terms of your volunteer interests. Online manual, required forms, competency quizzes, webinars and suggested reading. For applicants and current volunteers. Volunteer Program Survey – How are we doing? Please take a few minutes to let us know how your experience has been volunteering with us. Provide feedback on current programming, offer suggestions for improvement and let us know what types of training and continuing education you’d like to see us provide. Contact our Volunteer Coordinator for more information about our program.